The survey looked at labels on over 500 meat and dairy products purchased from the major retailers and a number of independent shops. 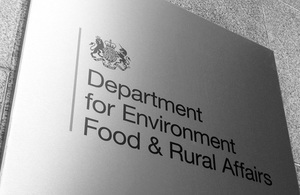 The majority of meat and dairy products now feature information on where their ingredients came from or where they were produced, according to research announced by Food Minister Jim Paice today. The survey looked at labels on over 500 meat and dairy products purchased from the major retailers and a number of independent shops. It is the first evaluation of country of origin labelling since the food industry put in place voluntary standards to provide clearer country of origin information to consumers last November. All butter in the survey was labelled with either the origin of the milk or the place where it was manufactured, or both, while 77 per cent of cheese showed the origin of the milk or the place it was manufactured. For liquid milk, 86 per cent of products sampled had some form of origin labelling, with half of all milk showing the origin of the milk, while just over a third showed where it was manufactured. However with fresh cream, a third of products showed no origin statement, and only one sample in six showed where the milk came from, with half showing where it was manufactured. All retailers’ own-label liquid milk included a statement about where the milk came from, while 59 per cent of branded milk met the same standards. For bacon, sausages and other lightly processed meat products, 82 per cent had some form of origin labelling, with 67 per cent providing information on the origin of the meat ingredient, and 15 per cent only listing where the product was manufactured. Nearly one in five didn’t include any origin statement. More complicated meat products, such as pies and ready meals, showed that 76 per cent included some form of origin statement. The food industry expects to see further improvements in meeting the voluntary principles as stocks of old packaging and labelling, manufactured before November, are used up. “Honest food labelling is a priority for me. Consumers want to see clear, honest labels that allow them to make a choice about the standards and origin of their food. They are entitled to believe that if a label says or implies that a product is British, it is British. Clearer origin labeling is a key commitment for the government. The voluntary code agreed in November 2010 will reduce confusion in the origin of products and make the British consumer the best informed in Europe. The research can be found at www.defra.gov.uk/food-farm/food/labelling/country-origin/.